I only venture to downtown Fort Wayne once or twice a week, and yet that is still countless times more than the vast majority of my fellow high schoolers. Of course, one reason could be that my high school is located 30 minutes away from the downtown area. However, it is hard to ignore the prevalent stigma that the city offers little for those of us who are still minors. Even so, this common misconception is far from true. Fort Wayne has a lot to offer high schoolers, if they only know where to look. Noah Johnson is a high school blogger for Input Fort Wayne. I write this to article as someone who once had this mindset—the feeling that my city had nothing for me to do beyond my home and my school. Yet, after joining the Fort Wayne Mayor’s Youth Engagement Council last year, I was obligated to travel downtown on a weekly basis. In doing so, I began to discover all of the places that I had once missed: Places like family-owned businesses and museums with revolving exhibits that never seemed to display the same artifact or painting twice. Who could ever forget the sight of the large glowing wreath on the Indiana Michigan Power Building during the winter? 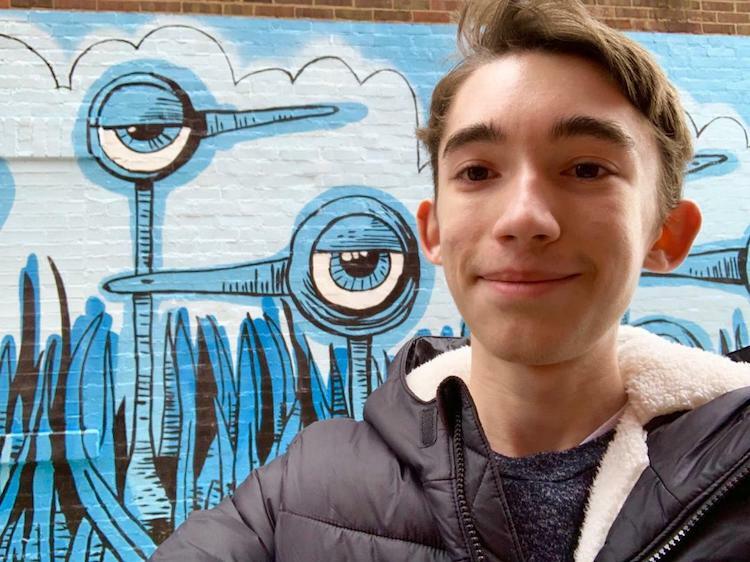 Or the sight of countless murals lining the city streets that evoke feelings of being in a much larger metropolitan area such as New York or Chicago? These days, it seems to me that while some people are “ahead of their time,” Fort Wayne is a city that is “ahead of its population,” if you will. When I’m downtown, it is hard to imagine that Indianapolis could have anything more that our city does. While there are many places for high schoolers to explore in downtown Fort Wayne, I have crafted a list of nine that stand out as places where students can form long-lasting memories in their own hometown. 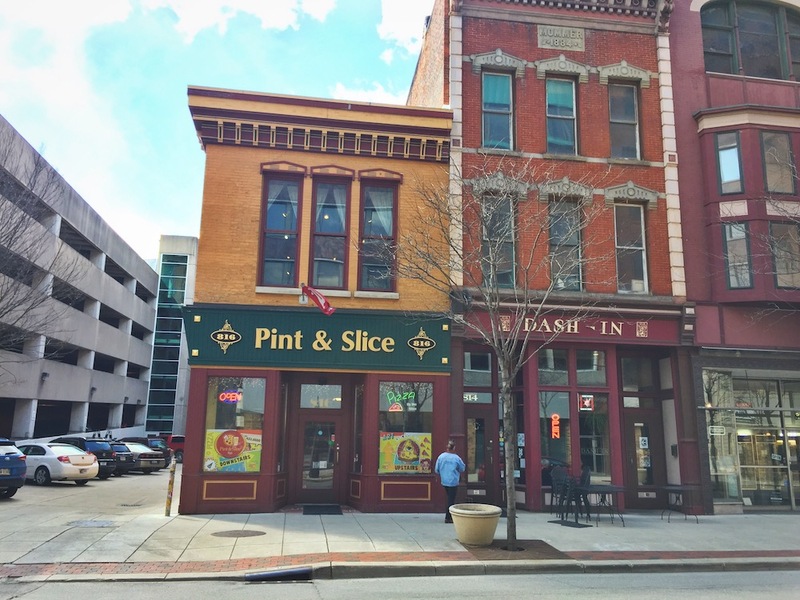 Pint & Slice is a two-story pizza cafe at 816 South Calhoun St.
Years from now, when I think of Fort Wayne whilst away at college, I will most likely first think of Pint & Slice, and I would not want to remember my hometown in any other way. I still remember my first visit to the pizza shop. Pint & Slice had been recommended to me, and when I went there, I expected good food, but was not necessarily expecting anything else. Yes, I did walk away thinking that the pizza was the best that I had ever had, but I also walked away thinking that the restaurant had a certain charisma to it that other pizza places had been lacking. The place had soul, had heart. It wasn’t a “put the pizza in the oven and serve” type of deal. I could tell that passion and thoughtfulness had been put into every slice. If the name has you wondering whether Pint & Slice is family-friendly, don’t let the word “pint” deceive you. The restaurant at 816 South Calhoun St. is a place for people of all ages, and it’s bound to become a local favorite. From young children to high schoolers—even former President Bill Clinton—everyone relishes a visit to this city staple. While the first floor is nice with some front window seating, there is even more to see on the second story than you might expect. It not only features additional seating and an event space, but also an art gallery that has a new opening every six to eight weeks. 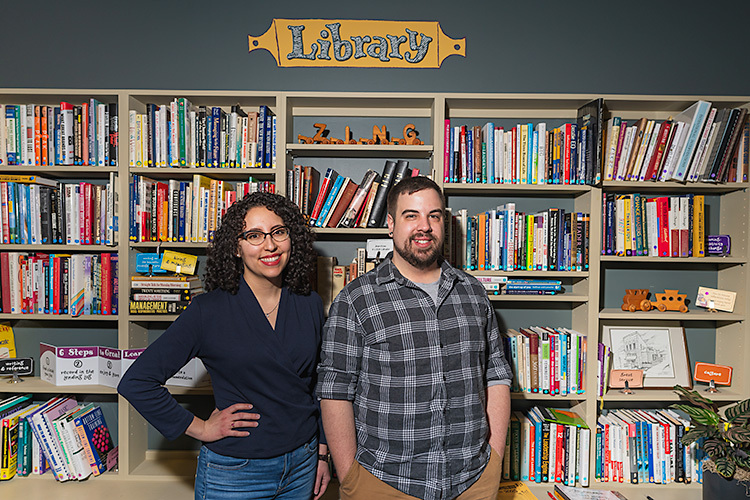 “With a growing art scene here in Fort Wayne, we are really happy to be a part of it,” says manager Bradly Harbaugh. There's a mural by the famous artist Yis Goodwin on the side of Pint & Slice. 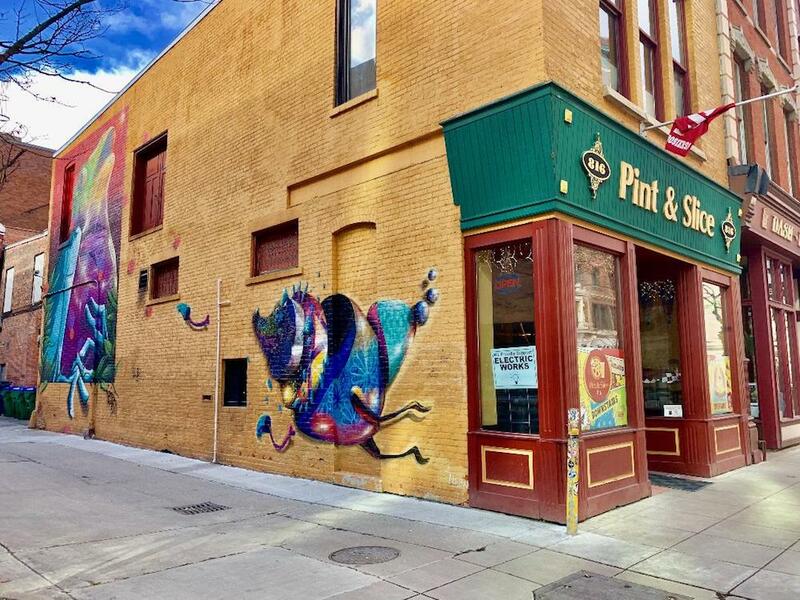 Pint and Slice definitely has been a part of that scene for some time, as it served as the location for the downtown area’s first-ever outdoor mural, painted on the side alley by the nationally renowned artist Yis Goodwin in 2014. So, for the countless students and families who sit at home and watch television while they eat, I must ask: What better than looking at fine art while you eat instead, while also supporting the downtown area? Between serving—according to Harbaugh— “the best pizza downtown,” displaying local art available for purchase, and having a metropolitan vibe, there is little reason not to pay this place a visit. A small warning, though: Once you eat pizza at Pint & Slice, you will become a downtown regular yourself. The Fort Wayne Museum of Art features many rotating exhibits throughout the year. Odds are, you have made a visit or two to the Fort Wayne Museum of Art over the years. But you most likely have not seen the artwork currently being displayed. Due to the Museum’s rotating exhibits, they never seem to display the same work twice. One week, you may walk in and gaze upon elegant sculptures of glittering glass. The next week, the museum may be displaying thought-provoking abstract paintings or even an entire room of guitars from across the globe. To be precise, exhibits are displayed for a period of six to 12 weeks, and after that period has elapsed, certain exhibits close for a period of five to 10 days to install new artwork. 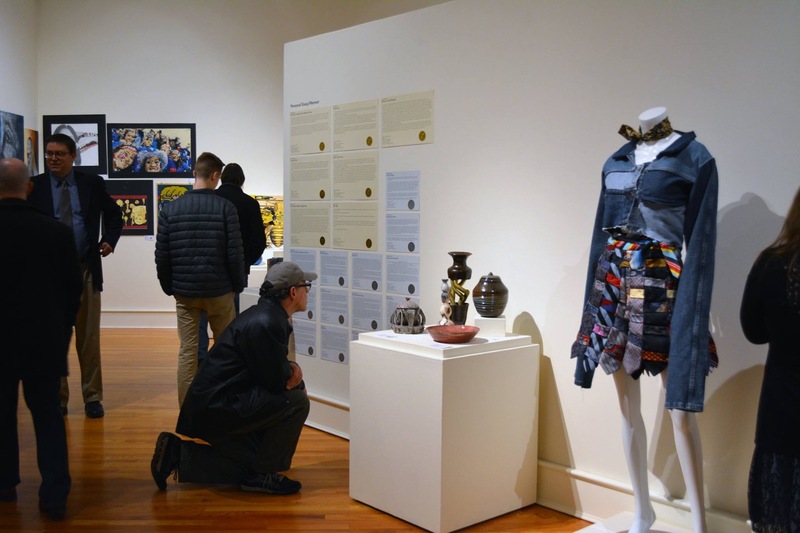 The Fort Wayne Museum of Art is not just local artists on display, as art from some of the nation’s most renowned artists can find its temporary home here while touring the country. Of course, the museum also features a permanent collection, including several Picasso’s. High schoolers like myself should visit the museum not only to get a greater appreciation of and a broader exposure to local and national art, but also to relax in the tranquil, mind-stimulating halls of the museum, which act as a perfect distractor from our hectic lives. The Urban Hippie is a downtown boutique at 534 W. Berry St.
For the girls who find the run-of-the-mill visit to the mall unappealing, yet simultaneously desire to expand their wardrobes, luckily there is a clothing store downtown to satiate their need. 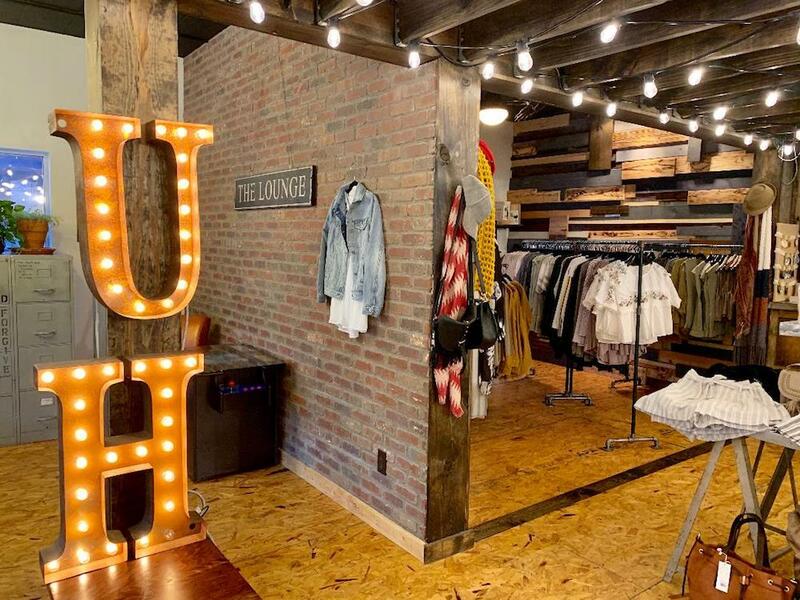 The Urban Hippie, located at 534 West Berry State, provides a dynamic and instantly-welcoming alternative to other clothing stores, as it has a modern feel characteristic of the downtown scene. “We have a unique atmosphere, a mixture of Boho and urban textures, and styles that appeal to a lot of people,” says Tammy, the shop’s owner. Whether you’re looking for a new sweater, a dress, or even jewelry, The Urban Hippie certainly has something in its diverse and expansive inventory to match the item in mind. The store not only has a large range of styles, but also a shopping experience that is sure to prove different from that of other, more traditional clothing stores. It offers “throwback and timeless jams,” “a good price point,” and “a cozy, vibrant atmosphere,” according to Tammy. Looking around the shop, there’s a gaming machine, a lounge, plywood floors, and a canopy adorned with lights. The environment speaks of genuine friendliness and care, and once inside, it is easy to forget you’re in a business and not the house of a close friend. At latte art throwdowns, baristas pour latte designs in front of a live audience. Located directly across from Pint & Slice, Fortezza Coffee is the place for high schoolers to go when they just simply want to “hang out” somewhere downtown. While there may be an abundance of coffee shops around Fort Wayne, Fortezza is definitely worth the drive into the city center. It has craft coffee with latte art, a welcoming atmosphere, displays of local art, and a diverse menu that not only features coffee and tea, but also smoothies, muffins, cake, and sandwiches. The café even has a large room in back that can be reserved for study groups or simple meetups with friends. On top of that, Fortezza also won me over by its use of environmentally friendly paper straws. 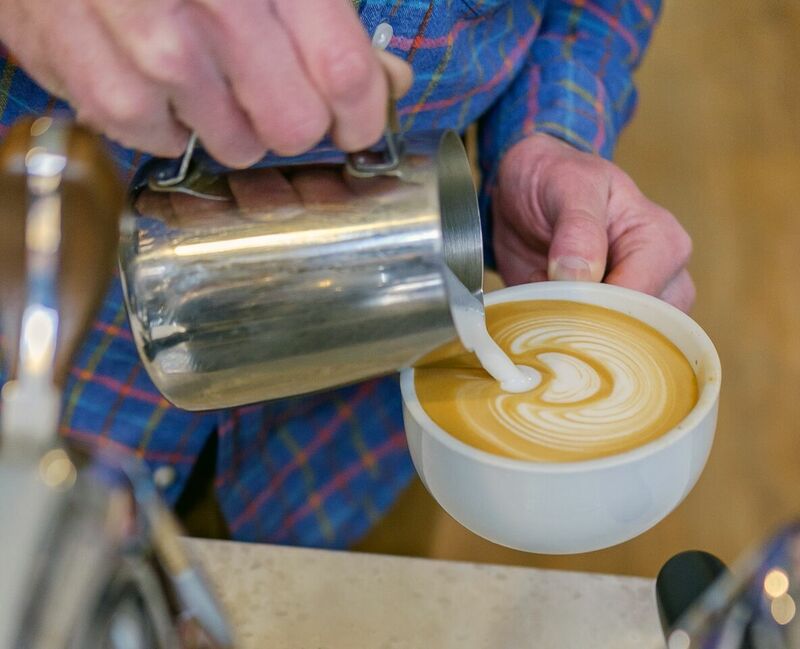 It will give you your caffeine fix, and most importantly, a sense of real community downtown. The Fort Wayne Escape Room is on the second floor of 327 E Wayne St. 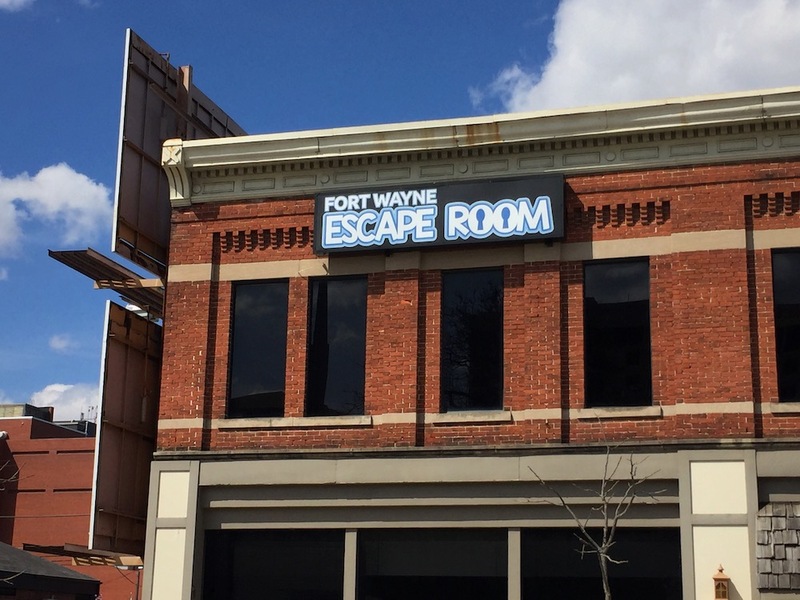 If you’re looking for something fun to do on a weekend with friends, or just need an escape from the stresses of your life, where better to go than the Fort Wayne Escape Room? Puns aside, escape rooms have recently popped up as a form of entertainment that seems to be taking the nation, and Fort Wayne, by storm. They’re essentially “live action” entertainment centers that put you through a series of obstacles to escape a scenario. Each room has its own theme, ranging from being kidnapped and put in a shed, to attempting to locate a lost spaceship, or having to escape a dungeon before the arrival of the Queen’s executioner. You are then given one hour to escape, and in order to do so, you must solve certain puzzles, which typically involve searching the area for clues and finding the codes to crack combination locks. At first, I was skeptical of the concept. 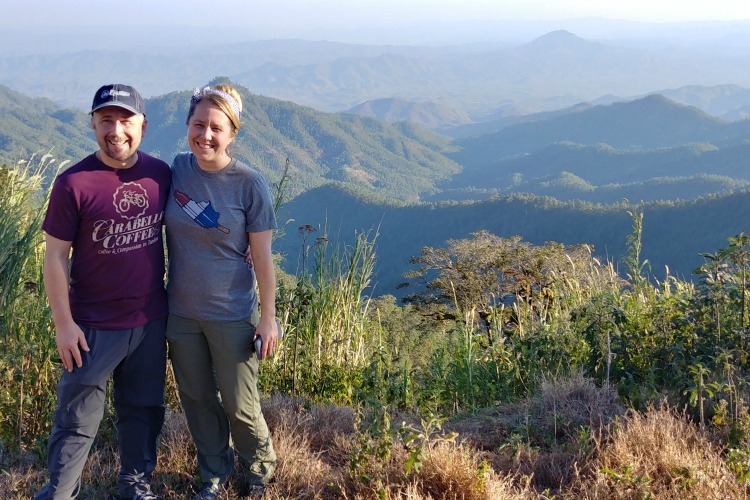 However, the experience not only was exceptionally enjoyable, but also one that reinforced practical skills, such as effective communication, critical thinking, and working under pressure. Solving these puzzles requires an immense degree of creativity and necessitates thinking outside of the box, so they could be useful for group team building activities, too. Unfortunately, to prevent potential giveaways, I cannot show or describe the appearance of each room or the logic puzzles involved. However, I can say that the scenario that I chose, the “Taken” scenario, had a mere 15-20 percent success rate. I was unable to escape from the room before the timer hit zero. If you desire to take on the challenge for yourself, I recommend that you go with at least two to three people, as each room can hold anywhere from six to eight, and it is as they say—two minds are better than one. Thus, your chances of success will increase with the number of individuals in your party. The History Center is in Fort Wayne’s former Town Hall building at 302 E Berry St.
By merely gazing at the building standing at 302 East Berry St. without even knowing its function or having any prior exposure to it, you can easily discern that it is a history center, or at least, that it’s played an essential role in our city’s history. 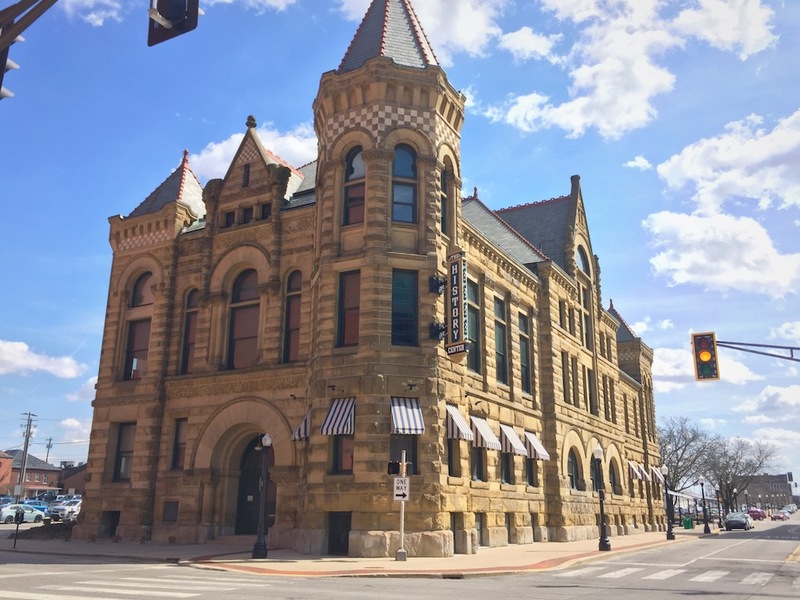 Due to the building’s quasi-Victorian style architectural appearance (it once served as Fort Wayne’s Town Hall), it seems to be permeated with stories of the city’s past, which continue to influence the growing landscape of Fort Wayne today. This goal applies youth of all ages—from elementary schoolers to those entering college. We’re all are required to enroll in history classes, and what better way to experience history than to witness the components of its making firsthand? Upon entering the museum, I was greeted with the sight of a canon in the entryway, pointing out the window towards the parking lot as if to shoot at the incoming cars, and I could not help but be transported back to the War of 1812. It sounds a little over-the-top, but walk into the History Center, and see for yourself. If you dare to wander down to the basement, you’ll find what remains of the actual former City Jail, too. DeBrand Fine Chocolates offers a wide assortment of sweet treats. Perhaps the photo (taken at DeBrand’s downtown location at 878 Harrison St.) is enough to make you want to add this local chocolatier to your to-do list. 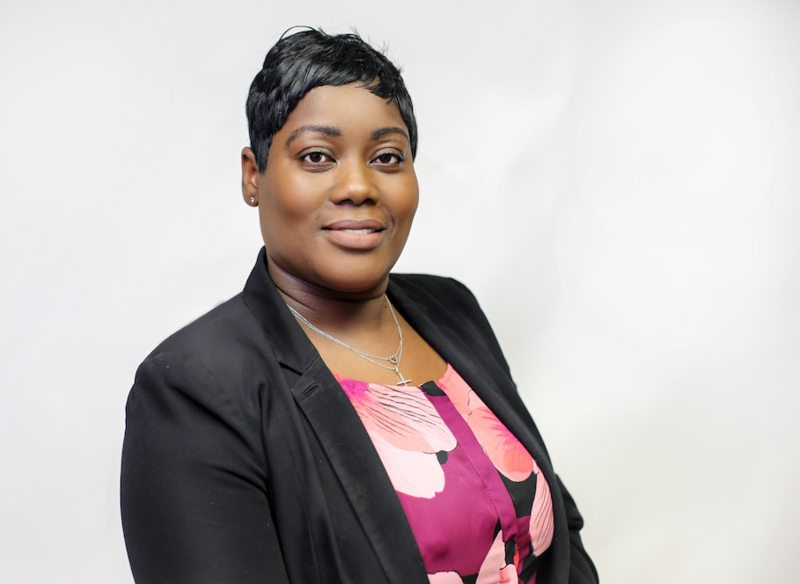 However, if not, please allow me to shed some light on this commonly misunderstood brand, because while DeBrand is a household name in Fort Wayne, there are several misconceptions surrounding it. The first is that DeBrand’s chocolate is only to be purchased and enjoyed at holidays, notably on Valentine’s Day. Upon entering the storefront at the Ash Skyline Plaza downtown, I expected to find a limited selection meant for that infamous date in February. But I was proved deliciously wrong, for it became apparent to me that DeBrand is a place that can be visited as often as your local coffee shop. This coincides with the second misconception: that DeBrand only sells chocolate products. I could not help but notice, upon examining the café-like shop, that ice cream, gelato, and drinks were also available, making DeBrand a viable place to catch up on work or meet up with friends. Of course, there are other reasons to visit. 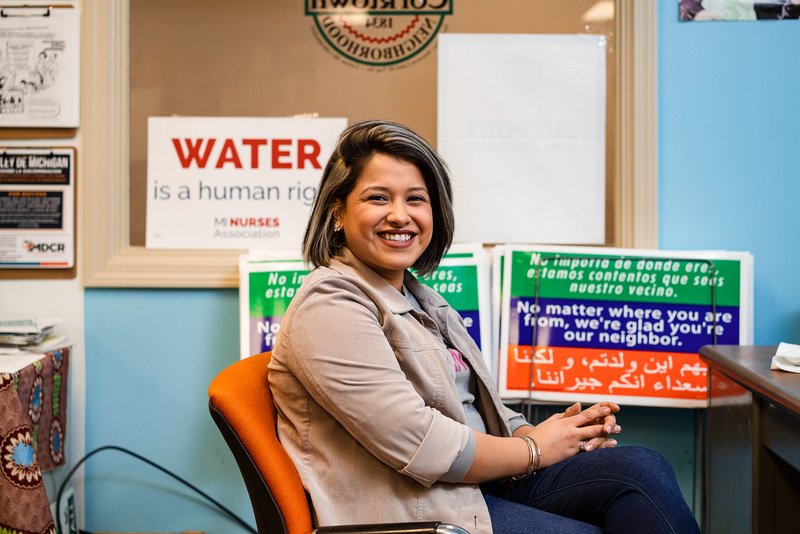 DeBrand is so well-received by not only Hoosiers, but also individuals across the nation, including celebrities like Ann Curry, Demi Lovato, Marilu Henner, Marie Osmond, George Lopez, and countless others listed on its website. 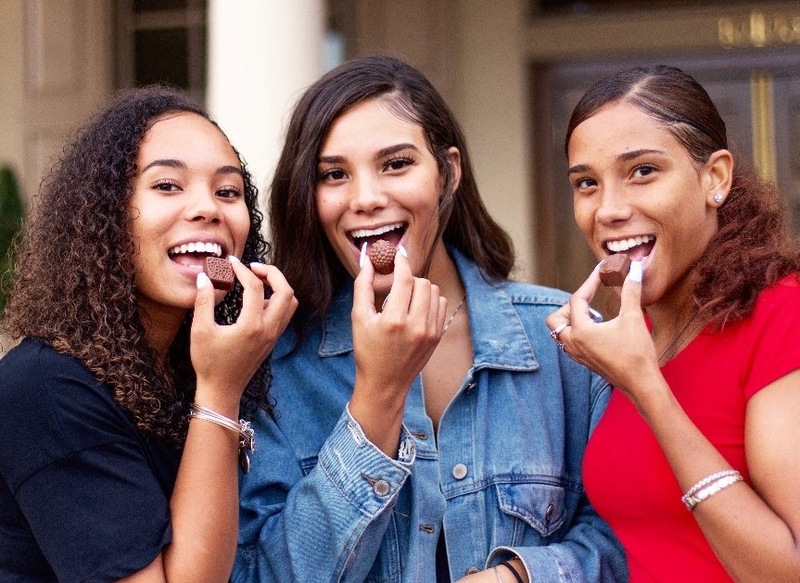 So, not only is it a great place for high schoolers to treat themselves and their loved ones, but also, it’s an example of a local business becoming a nationally-acclaimed staple. After all, the first DeBrand location was in Fort Wayne, operating out of its founder Cathy Brand Beere’s childhood home. Regional artists decorate Main Street for the Three Rivers Festival's Chalk Walk. Fort Wayne’s population is growing by the day, and so its quantity of activities and seasonal festivals offered to its residents. 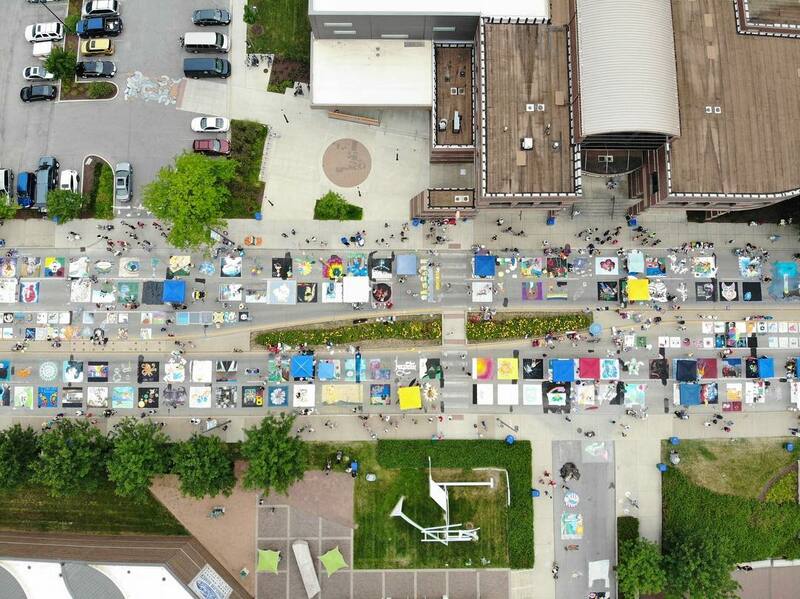 This is made possible in part by the contributions and planning efforts of the Downtown Improvement District, which organizes a wide array of diverse events annually. These events include, but are not limited to: Fright Night in October, Holly Trolley in November, and BuskerFest (a day of street performances) in June. If you want to make a unique holiday memory, The Zombie Walk that occurs during Fright Night always proves to be an experience worth dying for (get it?). Or if you want to get more familiar with the layout of downtown and its local shopping options, then Holly Trolley is an event you won’t want to miss. The trolley cars, which look as if they have emerged from a wintery 1950 New York City Street, take travelers throughout the downtown area to the local establishments, which often offer discounts and deals exclusive to trolley riders. 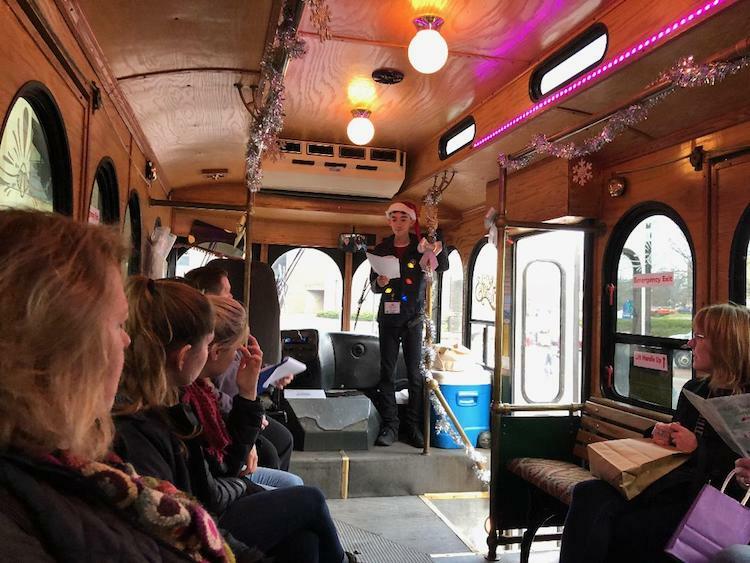 Noah Johnson speaks on a Holly Trolley Tour among downtown shops. When I went last winter, the event exposed me to the large selection of businesses downtown, and gave me not only a newfound understanding of the city, but also a newfound appreciation of it (not to mention the fact that I got the once-in-a-lifetime opportunity to wear a Santa hat and necklace of holiday lights in public). While many of the deals are catered exclusively to adults, if you ask me, high schoolers have the chance to enjoy the event as much as anyone. It’s a way for us to explore downtown I the winter without having to worry about driving ourselves throughout the area, which can be intimidating when you don’t know where to go. Put simply, you can enjoy the event even without a driver’s license. 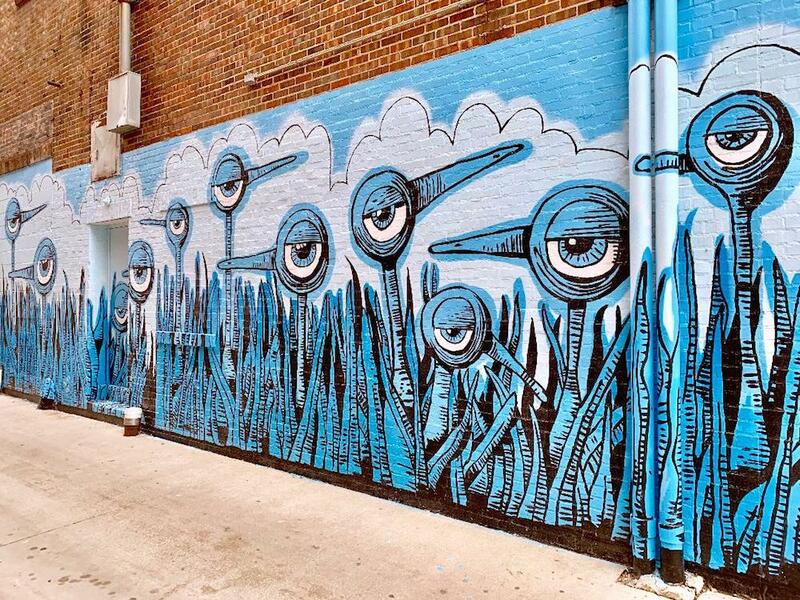 Enjoy the murals coordinated by Art This Way in downtown Fort Wayne's alleys. It is often said that life is about the journey, not the destination, and if you find yourself journeying throughout downtown Fort Wayne, you may also find yourself so focused on your eventual destination. But don’t forget to look around and notice the environment along the way. If you’ve ever found yourself describing Fort Wayne as “industrial” or “boring,” then you may have not noticed the creativity and voice that is arising within it, portrayed in murals that line the city streets and alleys. From an ice-cream loving panda to the poet Walt Whitman to a flock of blue birds that look as if they have emerged from the pages of a quirky childhood novel, the streets of Fort Wayne are alive with color. They’re works of art that have been created to brighten up the city’s alleys, coordinated by an organization called Art This Way, and they define the city almost as much as the people who inhabit it. I cannot help but be marveled at how the artist Bryan Ballinger carried his bird flock design seamlessly onto the pipes that climb the side of the Ambassador Enterprises building at 927 Harrison St. or how artist Tammy Davis captured the human-like qualities of animals with her whimsical and playful panda depiction on the side of Star Financial Bank at 127 West Berry St. The murals of downtown Fort Wayne are more than something to be seen along your journey to somewhere else; they can be a destination in and of themselves. See how many you can find, and don’t forget to snap some photos while you’re at it.